R.J. Rushdoony: 00:57 The fourth commandments requires of us that we keep the sabbath holy, and it declares that there are six days for work, and the sabbath, the seventh, is to be kept holy unto the Lord. Now, in analyzing this commandment, there are two aspects that we must note. First of all, the commandment tells us that man, like God, is to work and to rest, that human life is to be a copy of the divine’s life. The work of God’s people is to be instruments in the restoration of the divine order to the earth. Subdue the earth and exercise dominion over it. This is the great creation mandated to man. R.J. Rushdoony: 02:01 This is the work of man. This is that which man must dedicate himself to so that we must never forget that the sabbath ordinance sets apart one day indeed for rest, but it sets apart six days for labor. Now, this does not mean that we must have a six-day work week, but that six days are dedicated to our vocation and our vocation must be given over to work in those six days. The second, our labor, like God’s labor, must terminate in a happy rest. R.J. Rushdoony: 02:50 Human labor is not to go on in endless circles, but it’s to end in a happy harmony and result so that the seventh day is the day of rest, but except for works of necessity and works of mercy, healing and the like, it is to be the cessation of work. In analyzing the jubilee, we saw that the jubilee brings out this aspect of the sabbath. The sabbath is to be a time of jubilee, of rejoicing, of a cessation of work, and a happy confidence that God will ultimately bring in the great sabbath, the great jubilee. R.J. Rushdoony: 03:41 We must remember, moreover, that the first chapter of Genesis, as it describes the six days of creation, ends each day with a statement, the morning and the evening were the first day, but when it comes to the seventh day, it does not cite it as ending so that the first six days were six 24-hour days that began and ended. But the seventh day, it was again another day like all the others, in a sense never ended because Genesis one does not speak of it as closing, so that the divine sabbath, God’s rest, covered all over history. It is around us, it surrounds us, and its purpose is to absorb redeemed man [inaudible 00:04:47]. R.J. Rushdoony: 04:49 When we are saved, we are taken into that sabbath rest, and the more we grow on grace, the more our sanctifications we’ll see, the deeper our rest in the Lord, until finally the perception of that rest comes with a new creation. Thus, the sabbath speaks both of work and rest, effort and result, labor and the goal of labor. And both concepts are basic to the sabbath. The sabbath, therefore, gives purpose to man’s life because it climaxes work. It makes work meaningful, purposes. It links it to a joyful consummation. R.J. Rushdoony: 05:43 The sabbath looks backward to creation and to the creation’s sabbath for its pattern. It looks forward to the great sabbath consummation, and it looks upward to God in assurance of his grace and victory, that God will bring about his victory in time and the fullness of it in eternity. Restoration is basic to the concept of the sabbath. That restoration clearly involves work. The sabbath has no meaning unless it is preceded by work, and it rests on the foundation of our labor in our calling. R.J. Rushdoony: 06:40 As we saw last week, it is God’s covenant sign with man. It declares God’s grace and efficacious work unto salvation so that man can rest for as much as ye know that your labor is not in vain in the Lord. So that the sabbath tells us, no matter how frustrating our work is in the sight of the world, how frustrating it is in our own sight as we see the tide of evil around us that our labor is not in vain in the Lord. God makes all things work together for good to them that love him, to them who are the call according to his purpose, so that our labor can never be fruitless. R.J. Rushdoony: 07:32 Every sabbath, we rest in the fact of God’s absolute sovereignty. We rest in the fact that through our work, the previous six days seemed futile and hopeless, and though the tide of evil seems to be running against us and over us, our labor is not in vain in the Lord because he makes all things work together for good to them that love him, to them who are the call according to his purpose. So, whatever our work the previous six days may seem in the sight of man, futile, and in our sight hopeless, on the sabbath we rejoice in it knowing that it is not in vain in the Lord. 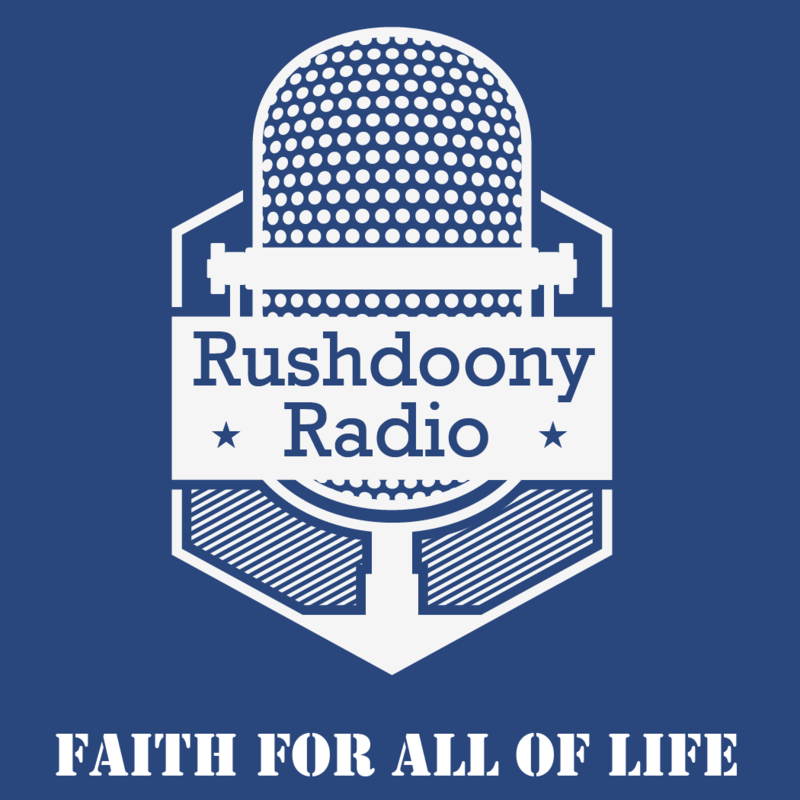 R.J. Rushdoony: 08:32 Six days, thou shalt labor. Six days are set aside for work, and the creation mandate is “Be fruitful, multiply, fill the earth and subdue it, bear rule over the fish of the sea, over the birds of the air, and over every living, moving creature on earth.” This is the creation mandate of Genesis 1:28. It lays down the duties of fertility, of work, and of dominion. These duties were established before the fall. They continue after the fall, but with a serious impediment. Man, the sinner, cannot keep God’s laws or discharge his duties, and so this work is in vain. It is beset with frustration, with all kinds of inner and outer handicaps, but the redeemed man can work, and therefore he can rest. R.J. Rushdoony: 09:45 It is only the man who knows how to work, which is the Christian man, who can rest because he has the joy of his calling and knows that under God he is accomplishing something, and the restoration of God’s order, in the abolition of sin and death from the law, and the restoration of the fullness of health, which is the fullness of salvation. Therefore, knowing that his labor is not in vain in the Lord and that the goal is, in time a world in which Christ and his law prevails, and in eternity the new creation, he labors joyfully and rests. Truth. R.J. Rushdoony: 10:44 There is, therefore, an inescapable relationship between work and the sabbath. When we truly work, we bring all things into relationship to God and in dedication to him so that nothing can be outside of God. All things are done unto him. This means, he used biblical language, the total circumcision of all things. This brings us to our text. It is one of the sabbath’s law. It declares that when you planted a vineyard or an orchard, the fruit thereof should be counted as uncircumcised the first three years. The first three years of growth of any vine or tree were sabbath. R.J. Rushdoony: 11:53 The fourth year, the fruit thereof shall be holy to praise the Lord with withal. The fourth year, it belongs to God. It had to be taken to his sanctuary, or else if you kept it, you had to redeem it with a fifth … What? As a value thereof. That is, if you had fruit worth $100, then you redeemed it for yourself by paying 120. In the fifth year, shall ye eat of the fruit thereof that it may yield unto you the increase thereof: I am the Lord your God. R.J. Rushdoony: 12:36 Now, the commandment also makes clear that the fruit was to be pinched off on those other years. It’s obvious, of course, one of the meanings of this is definitely conservation. The fruit was to be pinched off, dropped to the ground and decay, and also that the young tree might put its energy into growth, into maturity before it began to bear so that the vine or the tree for three years had to grow. It is interesting to note that the old orchards, which were kept in terms of this kind of principle, used to last here in California, for example, 40 and 50 years and were commercially profitable. R.J. Rushdoony: 13:42 Now, of course, the vineyards, Thompson seedless grapes, for example, the second year, they are brought into production, they’re harvested, and the trees as quickly as possible. The result is a very much shorter life for the tree. So there is definitely an aspect of conservation here. But this clearly is not all because when we look to very literal word-by-word translations, we find that, it reads, “Then he shall count the fruit thereof as uncircumcised,” or “Then shall ye circumcise the uncircumcisioned fruit.” In other words, it is uncircumcised or polluted unto you. It is disqualified or unfit to eat. The fruit is to be regarded as unclean, [inaudible 00:14:51] unclean. R.J. Rushdoony: 17:20 But the whole point of this law, as with all the law, is that we take life on God’s terms only. We cannot say, for example, “I eat good nourishing food 364 days in a year. This entitles me on the 365th to take a little [inaudible 00:17:51] without suffering any damage.” Saint James said, “If the law is broken at one point, it is broken at every point.” The earth is the law, and it is to be used on his terms and under his law. So that while the note of conservation is important here. Even more important is the note of obedience, the fact that God takes priority, that God alone is God. R.J. Rushdoony: 18:40 The earth is the Lord’s and the fullness thereof, the world, and they that dwell therein, including ourselves, and so we, as God’s people must keep God’s law on God’s terms. Thus, we see that the sabbath was not kept merely by inactivity, not in the [inaudible 00:19:07] manner by refusing to eat eggs that a hen had labored over on the previous sabbath, but the sabbath is kept by [inaudible 00:19:17] law-abiding work, work unto the Lord, work which ends in a rest in which we know that our labor is not in vain in the Lord, work and activity which proceeds on the basis that that which God does not allow us is forbidden fruit to us, that even as the forbidden tree in the Garden of Eden represented a principle of law, of obedience, so the leafs of God’s commandments represent a fundamental principle unto us. R.J. Rushdoony: 20:10 On the sabbath, therefore, man who has labored under the Lord rejoices in the Lord. He rests in his labor knowing that they are not in vain in the Lord. Like Adam, he can truly rest when he abides by God’s law, when what God commands is obeyed, and what God forbids is forbidden fruit to him. Man exercises dominion under God, but he recognizes that God sets the boundaries on that dominion. Six days thou shalt labor unto the Lord, and on the seventh thou shalt rest unto the Lord. Let us pray. R.J. Rushdoony: 21:06 Our Lord and our God, we thank thee for thy word, and we thank thee that thou hast given us work to do in the restoration of the earth. We thank thee, our Father, that thou hast given us a confident rest week by week in the blessed [inaudible 00:21:27] that our labor is not in vain in thee, that thou dost make all things work together for them, unto good for them that love thee, for them who are the call according to thy purpose. We thank thee, our Father, for the joy of work and rest in thee. Make us ever mindful, our Father, how great thou art, and ever joyful in thy praise. In Jesus name, amen.